There are a plethora of dining establishments, both counter and table service, throughout World Showcase. There are the big names that always have a full house and lines out the doors, such as Le Cellier or Boulangerie Patisserie, but sometimes an off-the-beaten-path semi-quiet place to partake in a different dining experience is just what guests are craving. Along the promenade there is no port more out of the way with fresh fare than Japan’s Yakitori House. Situated high on a hill, overlooking temples, castles, gardens, and ponds sits Yakitori House. With a garden and water feature gurgling in the back of the restaurant, there is not a more tranquil spot to dine and rest in the cool shade away from the throngs of other guests. While the name Yakitori implies a small establishment where skewers filled with bits of chicken are grilled, usually over charcoal, the menu in this house skips the skewers for a variety of other Japanese dishes. 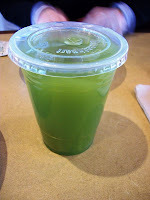 For starters, while the traditional beverages are available, Yakitori House also offers hot and iced green teas, hot sake, Japanese beers, and plum wine. 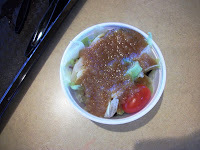 Turning to the opening salvo of salads and sides, the typical miso soup and side salad with ginger dressing are available in addition to the full-sized Chicken Ginger Salad. Entrees include a small variety of sushi rolls, teriyaki chicken, sukiyaki, udon bowls, curry, and combinations that include various selections of the above items. During the frigid weather that surrounded Marathon Weekend this year, my wife and I chose to partake in some of the steaming bowls of udon. She decided upon the Japanese Curry Udon, while my palate was craving the Beef Udon. 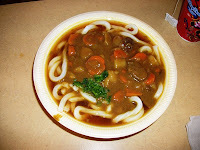 The Japanese Curry Udon, served with a variety of vegetables, chunks of beef, and a curry was spicy enough to activate the sweat glands, but in a good I-don’t-need-to-dive-into-my-glass-of-tea way. More in line with a spicy soup than a typical curry dish, the dish was a pure palate pleaser. 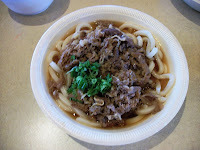 Meanwhile, my own Beef Udon combined a savory broth with thin strips of beef and green onion that, when couple with the hearty udon noodles created a savory yet sweet bowl that I happily devoured. While we shied away from dessert, saving that for a trip down the promenade to France, I would have to say that the ginger cake, named for the spicy-sweet ginger icing, was almost enough to tempt me away from my beloved Patisserie. Guests familiar with Japanese restaurants or utility sushi can put together a meal at Yakitori House that is at once foreign, and yet something that they are comfortable with. There are a few items off the typical Japanese menu for the brave of heart, but nothing too adventurous for the newly christened foodies. The real joy of dining at Yakitori House comes from a simple meal in a calming environment. To be able to step away from the hustle and bustle of a typical tour through Walt Disney World, that is a tremendous treat that Yakitori House offers free of charge.